Beginning with the class of 2018, Dartmouth will no longer offer college credit for good Advanced Placement (AP) scores, claiming these courses aren’t as rigorous as their college courses. Dartmouth, you see, is not for commoners. In 1819, their trustees won a landmark Supreme Court decision over the New Hampshire legislature. In trying to repeal the original corporate charter (a relic of King George III), to remake Dartmouth as a public institution, the Court proclaimed business first! Certainly, College Board’s invisible hand leaves an imprint on Dartmouth when it comes to “college readiness.” This highly selective non-profit, private school (~$58,000 for undergraduate tuition, room, board, and fees this academic year) boasts an acceptance rate of 10.1%. Dartmouth’s exclusivity depends on weeding out applicants with lower SAT scores to give it #10 overall ranking for national universities by U.S. News and World Reports. Dartmouth looks at only the best test scores; all the better for the students whose well heeled parents can tutor and re-test their kids to boost their chances to get accepted. The middle half of kids accepted at Dartmouth in 2011 had SAT scores ranging from 2050 to the near-perfect score 2360. Gravy train for College Board! Oregon is one of ten states and D.C. to pay the College Board’s PSAT at no cost to the students. We should question College Board’s assertion that America’s education system is “crumbling.” When they "elevate the topic of education,” College Board seeks to build a private enterprise on a public foundation to further expand AP classes. In a report last year, College Board boasted that 903,630 students took at least one AP exam. John Tierney, a former college professor and high school teacher argues that AP Classes are a scam. “AP courses are not, in fact, remotely equivalent to the college-level courses they are said to approximate.” He points out that students increasingly don’t get credit for course-work “that squelches creativity and free inquiry” and maintains that these courses impose "substantial opportunity costs" on non-AP students. 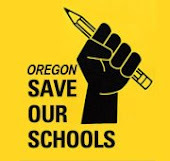 This session, Oregon legislators are sponsoring SB 222, which will require students to have twenty-four total credits to receive a high school diploma. Six of these credits must qualify for college credit at a post- secondary institution. No doubt, College Board is banking on this to pass. And isn’t that the point? “Non-profit” private education puts corporate profits over common good. We should urge colleges to make entrance tests optional and scuttle legislation that mandates college credits for a high school diploma.